Culms: Stems are rhizomes, long-creeping, branched, glabrous, sparsely scaly. Leaves: Leaves erect, irregularly spaced along stem, of two very different forms; sterile leaves simple, broadly triangular in outline, deeply-cleft into lobes that almost reach rachis; stalk to 23+ inches long, black, flattened at base; blade 5 to 14 inches long, 6 to 12 inches wide, yellowish-green; rachis broadly winged; lobes 5-11 per side, nearly opposite, lanceolate to narrowly-oblong, .5 to 7.2 inches long, .6 to 2 inches wide, net-veined, glabrous above, scattered white-hairy on mid-rib and veins below; margins entire, wavy or irregularly lobed near base; fertile leaves shorter than sterile, 6 to 24 inches tall; stalk 7.6 to 16 inches long, sparsely scaly; blade greatly reduced, twice pinnately-divided, 3 to 7 inches long, .4 to 1.2 inches wide, green, becoming black with maturity; segments linear, 5-11 per side, 1 to 2 inches long; ultimate segments bead-like, 1/12 to 1/6 inch in diameter, hard, brown at maturity, rolled tightly back, concealing sori (clusters of spore-bearing structures); sori round. Habitat: Moist woods, stream and lake borders, marshes, thickets, ravines, ditches; sunny or shady locations; neutral and slightly acidic soils. Toxicity: The leaves are toxic to horses, but it is rarely found in sufficient quantities in hay to pose a problem. Clinical signs include lack of coordination, walking in circles, unsteadiness when turning, yawning, and difficulty chewing. 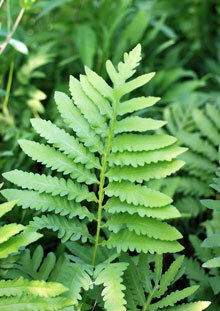 Uses: Native Americans used sensitive fern to treat arthritis and infections, steeped the plant and used the liquid to treat venereal disease and as a hair wash, made a poultice of the plant tops to treat deep cuts, and steeped the roots and used the tea to alleviate post-childbirth pain. The plant was also cooked and eaten after seasoning with salt, pepper and butter. Comments: The fertile leaves remain upright through the winter. The spores are released in March and April. The sterile leaves are deciduous. The common name "sensitive fern" alludes to the leaves turning blackish under light frost. The genus is derived from Greek onos "vessel" and kleio "to close", in reference to the sori being enclosed by the down-turned fertile leaf margins. Sensitive fern often forms large colonies. It is occasionally cultivated but can become weedy.